I like mouthpieces that are easy to play, especially in terms of response and tuning. But I also really like something easy to replace; I don’t like the idea of a mouthpiece that is so expensive, variable, or rare that if I drop it I can’t just order a new one, have it in a few days, and expect it to play like the old one. 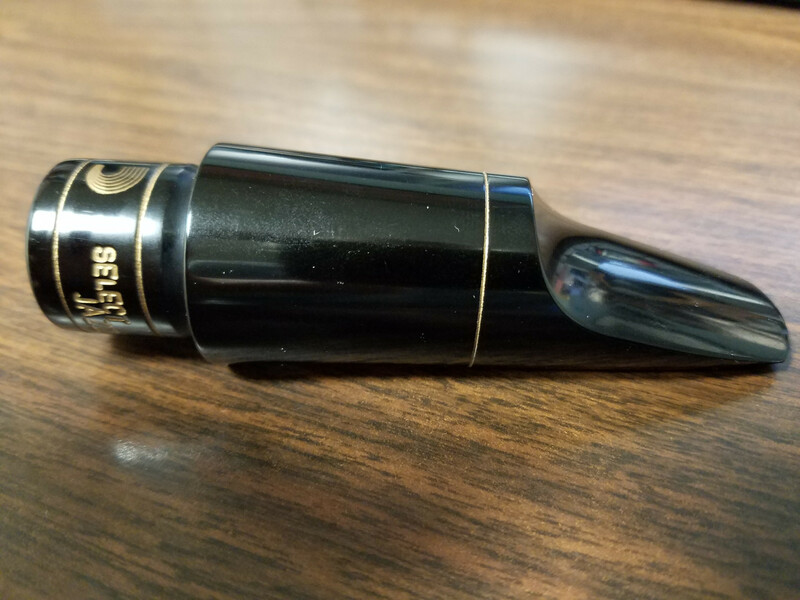 A few years back I did a fairly detailed review of the Rico Reserve clarinet mouthpieces (in two parts), and have been happily using the Reserves as my main clarinet mouthpieces ever since. The Reserves are, in particular, astonishingly consistent from specimen to specimen, presumably due to the very precise tooling that obviates the need for hand-finishing (which sounds cool but ultimately means a relatively high degree of variability). The pro-line products formerly released under the Rico name are now D’Addario Woodwinds products, and they now include some alto saxophone mouthpieces, the Select Jazz series. I was pleased to hear from a contact at D’Addario Woodwinds who sent me some samples to try out. My point of reference is the various Meyer-ish alto mouthpieces I have played for about the last 20 years, most recently the V16 series from Vandoren. I used the A6/medium chamber for a number of years, but more recently switched to the A6/small chamber, which gave me a little more bite in my sound that works well for me in louder situations (like big band lead playing, or blues gigs here in the Mississippi Delta) without having to strain as much. The new D’Addario Select Jazz alto mouthpieces are currently available in three flavors, the D5M, the D6M, and the D7M. Larger numbers in the middle correspond to larger tip openings (details at D’Addario’s website). I got a couple of each to try. Each one says “medium chamber” on the box, so maybe D’Addario is considering other chamber sizes. At the moment street price seems to be a little higher than the V16s, but still basically in the same class. If you read the second part of my Reserve mouthpiece review, then you won’t be surprised to see that the Select Jazz mouthpieces are extremely consistent. Check out the very even and symmetrical rails and tips. L-R: two each of the D5M, D6M, and D7M. Click for higher resolution. As mentioned in a couple of other reviews, the Select Jazz mouthpieces have an unusually tight fit on the neck cork, and they chewed up my aging cork a bit. Cork grease! 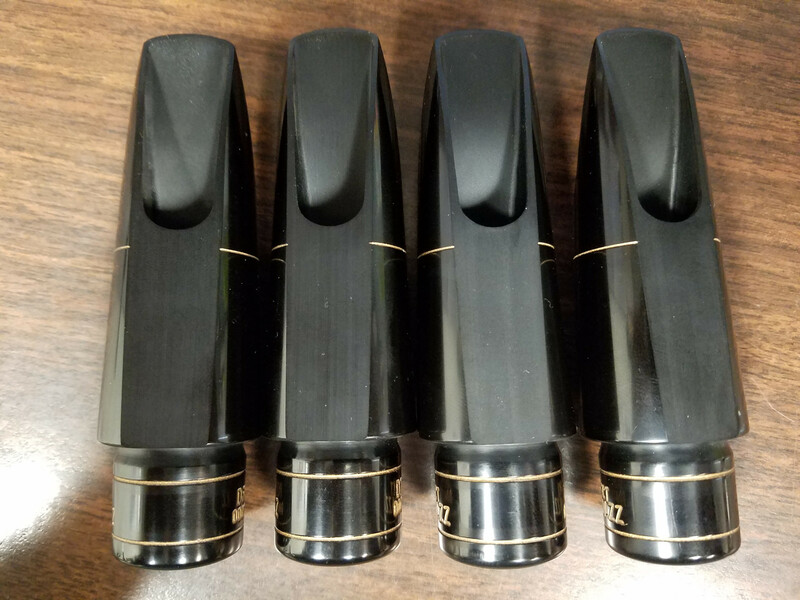 The mouthpieces have individual serial numbers, like the Reserve clarinet mouthpieces. When I asked about this during my clarinet mouthpiece review, the Rico/D’Addario rep told me there might in the future be some way of registering your mouthpiece online, maybe to access some kind of members-only content. I haven’t seen anything happen along these lines, so maybe there’s a more logical explanation, like that the numbers are just for quality control. 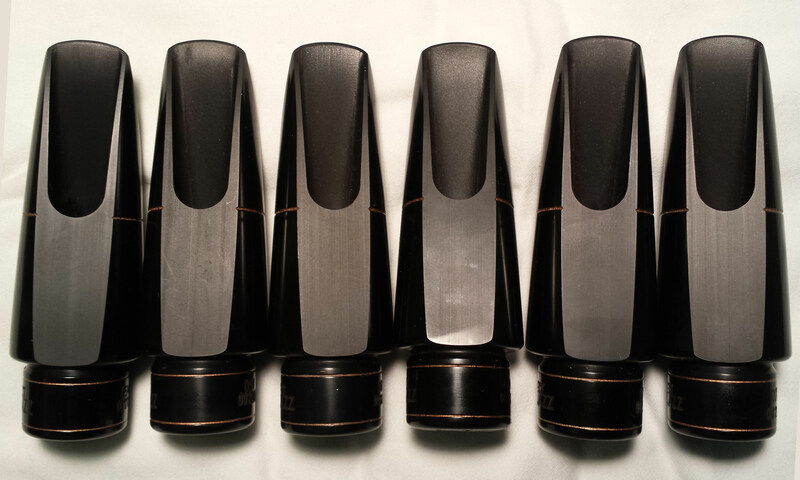 Here is a sound clip of each of the six mouthpieces I received, plus my two V16 mouthpieces for comparison. For all the sound clips I used the same inexpensive fake-leather-type ligature, but different reeds, a D’Addario Select Jazz filed 3S and a filed 3M, depending on which worked best with each individual mouthpiece. The V16s and the Jazz Select D5Ms worked better with the 3M reed, and the Jazz Select D6Ms and D7Ms seemed to prefer the 3S reed. The Select Jazz mouthpieces have noticeably more stable intonation than the V16s, especially the D5M. This is a bigger deal than tone, which is more malleable and more subjective. The Select Jazz mouthpieces are, again, very consistent. This is the killer feature of D’Addario’s mouthpieces. I found the two D5Ms to be virtually interchangeable in terms of tone, response, and tuning, and the two D7Ms too. One of the D6Ms (#2) has, to my ear, just a tiny bit of an edge that I find unpleasant. I suspect that this one is slightly “off,” but the difference between the two is still quite minor compared to the differential in hand-finished production mouthpieces. I do still want something with some edge to it, and the V16 small chamber still feels like is has more of that than any of the seven others, but not by much. The Select Jazz mouthpieces seem to have a bigger core and body to the sound, plus a bit higher volume, so I’m thinking it may be an acceptable tradeoff as far as making my presence known among the electric guitars. Overall, I find the Select Jazz to respond better both down low in the staff and up above it than the V16s do. I didn’t play any altissimo in the sound clips, but I find the Select Jazz to have a slight advantage in that register as well. The D5M and, to a lesser extent, the D6M, seem to be the best fit for my style and needs. The D7M doesn’t work as well for me—it has the louder but more spread tone and less-stable intonation you might expect from a larger tip opening—but it’s still one of the best mouthpieces I’ve played in that category, and it’s really only slightly large, not nearly as extreme as the tip openings offered by some other makers. I think the Select Jazz D5M is going to be my new mouthpiece. 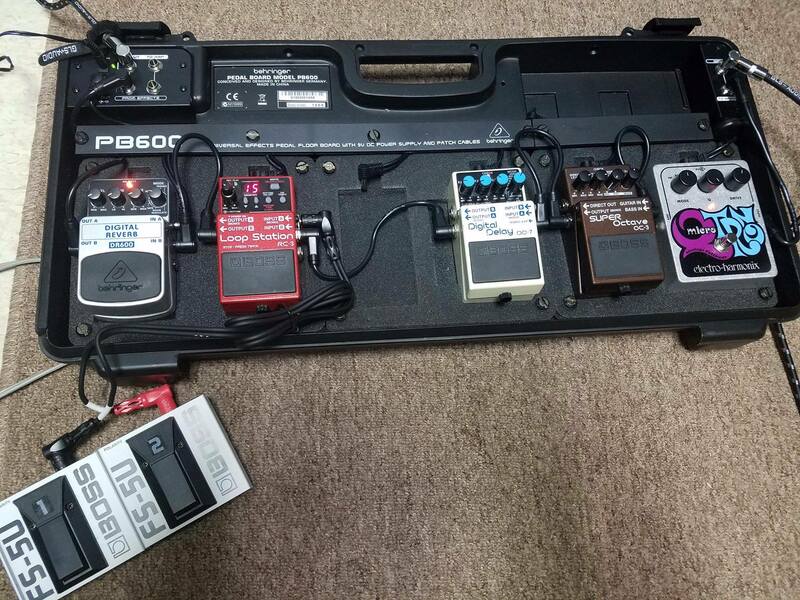 (I’m keeping a D6M in my case for now too until I can try them both on a loud blues gig, but so far the D5M has worked well for small-group jazz.) The combination of solid intonation, pretty-but-gutsy tone, budget-friendly price, and amazing consistency make this a solid, versatile, and practical option for a working saxophonist. They are great for educators, too—they are easy to recommend to students because they are so easy to play and because they are so reliable in quality (much less need to order a half-dozen on approval and hope there’s a “good” one in the bunch). A great all-around, no-nonsense alto jazz mouthpiece. I look forward to more offerings from D’Addario Woodwinds, perhaps alto mouthpieces in other chamber sizes, or mouthpieces for other saxophones. The idea of “tripletizing” eighth-note rhythms is especially pervasive, and especially dangerous because it is thrown around so casually by people without background in jazz music. Composers are sometimes guilty of this; so are conductors, arrangers, and educators. The issue with each of these bad notational approaches is that they try to approximate characteristic jazz rhythms with symbols that are rooted in the rather different rhythms of classical music. But real jazz swing rhythms aren’t dotted or 12/8 or triplets, or least they aren’t necessarily any of those. This leads to problems both for composers and performers. For composers, using a 12/8 time signature or eighth-note triplets in 4/4 too easily drags the work into a compound-meter feel. And jazz swing is decidedly not in a compound meter: the rhythms are very much duple in nature. Authentic swing almost always has an underlying feel of two notes per beat, even though those notes are not equal in length. Extended or frequent passages with a compound-meter feel (three notes per beat) are dead giveaways of a failure to really absorb swing style. For jazz-untrained performers, seeing dotted or compound-type rhythms on a page simply doesn’t provide fine enough information to accurately reproduce authentic swing style. It’s perhaps a bit like baking a cake from a recipe with each ingredient rounded off to the nearest tablespoon; the result will approximate a cake but likely won’t be especially successful. And even for the jazz-trained performer, sometimes the dotted or triplety notation can obscure the intended sound, something like typing a sentence into Google Translate, translating it into some other language, and then translating it back into English. (The result definitely loses fidelity.) Or, the poor notation can simply dull or distract from the jazz musician’s more authentic approach. Firstly, there’s no reason for it to be a mystery or a matter of “opinion;” using very simple technology we can measure exactly what jazz musicians are doing. The ratios, if we measure them, are very, very far from consistent, even taken independently of factors like tempo. (There’s a popular but not-uniformly-supportable idea that the notes swing “harder” [greater ratio] at slower tempi and less hard [ratio nearer to 1:1] at faster tempi.) The precise ratios are an expressive, interpretive matter, and ultimately up to the performers. The rhythms themselves are not the only factors that make swing sound like swing; articulation, phrasing, and other elements are also important, and also beyond the scope of my intended topic here. What I do like about the weird grace note approach is that it makes fairly clear the idea that the exact “downbeat” (quarter note) to “upbeat” (grace note) ratio is an interpretive matter. It also evokes what I find to be the most successful method of executing swing rhythms: think in quarter note pulses, and let the upbeats lead to the following downbeats. What I don’t like about this method is that it’s a hassle to write and to read. Note the absence of the “two eighths equal triplet quarter-eighth” indication. This way is simple to read and write, reinforces the duple nature of swing rhythm, and doesn’t prescribe a specific ratio. One might hope that a jazz-untrained musician encountering this would seek out some good training or at least listen to some good swing recordings. An important factor in improvising fluently (such as in a jazz context) is a collection of vocabulary. Broadly defined, this could include rote-memorized “licks” plus all kinds of other material: scale- or arpeggio-oriented patterns, for example. With improvisation, you don’t have the luxury of practicing your solo note-for-note; instead you have to develop a large pool of available material, and learn it so well that you can mix and match it on the fly. If you double on multiple instruments, the vocabulary pool isn’t really portable. You can bring your improvisational ideas with you from instrument to instrument, but you won’t be able to execute them smoothly unless you have put in the practice hours on each instrument separately. If you are doubling, say, saxophone and flute, you might find that the fingerings are similar enough that you can make a few things work, but it’s too easy to paint yourself into a corner, or to catch yourself using “close enough” fingerings that really aren’t, or to play with unsatisfactory tone or intonation. To do it right, and have the colors of multiple instrumental voices available to you as an improviser, treat each instrument like it’s your only one. I occasionally teach a university course in jazz improvisation, geared toward beginning improvisers. Sometimes I think prospective students are afraid to sign up because they don’t consider themselves already to be musically creative. On the other hand, I have some students enroll in the class with unrealistic expectations about the results, thinking that they will learn all the tricks and secrets and be ready for some fantasy gig. It doesn’t make sense to avoid taking French 101 because “I don’t speak any French”—you’re missing the point of an introductory course. But it also isn’t likely that by the end of the semester you’ll be ready to wow everyone at the smartest dinner parties in Paris. The good-news/bad-news is that most of what happens in a beginning improvisation class doesn’t feel creative or spontaneous at all. In my course, we do a lot of drilling of scales, arpeggios, patterns, and “licks,” and then trying to execute them successfully in a pre-planned way over a set of chord changes. The same happens in your first-semester French class: you memorize some basic phrases by rote, and try to use them in the right order in very structured “conversations.” At some point you get some very restricted freedom: you have to say what color le chat is, but you get to pick if he is noir or blanc. Similarly, in my class you might get to decide which of your two memorized “two-five-one” licks to use over the first four bars of the bridge, or whether to start that digital pattern on the root of the chord or the fifth, but that’s about it. Limited options don’t mean you aren’t really improvising (or speaking French), it just means you don’t have a lot of vocabulary to work with yet. I know that this rubs some improvisers the wrong way: I shouldn’t be regurgitating pre-packaged licks! I should be developing my own “thing!” For those people, I suggest you read a biography of any great improvising musician and find out what they did in the early stages of developing their thing. Or just try speaking some French: no need for grammar study or vocabulary lists! Do your thing! For those who consider themselves creativity-deficient: you can learn to improvise in a systematic way—it’s not something you’re born with (or without). I’ll teach you some existing vocabulary and some techniques for making your own, and then you can start putting them together in ways that make sense to you. You’re being creative! For those hoping to learn some “tricks:” the only useful trick I can teach you is to take the techniques from the class and hit the practice rooms. There aren’t any shortcuts to improvising well. It will require hard work over the course of many years. But the process can be a lot of fun! Okay, first of all: what I’m talking about here is the “mainstream” jazz tradition, insofar as such a thing exists (you can make a good argument that it doesn’t, really). “Jazz” is a wide net to cast. To flip it around, if I were going to list things that aren’t “classical” music, I might say “use of the electric bass guitar” or even “microtonality.” Are those things really mutually exclusive with classical music? No. But they are not part of the tradition of the Viennese masters, not what your local community orchestra would play, not what most people think of when they think of classical music. Free forms. Form in jazz is much stricter than in classical music. Most common jazz tunes have one of two forms. The first is precisely 32 bars in 4/4 time, with four eight-bar sections: AABA. The second is precisely twelve 4/4 bars, a “blues” form. Anything that doesn’t fit exactly into one of these categories is most likely very closely related to one of them. Free harmony. Bebop and hard-bop jazz are extremely tonal. While improvisers may play pitches that fall “outside” the chords, it is almost always within a tonal framework: the notes function as upper extensions of the chords, or at least they are used in a sort of polychordal way that has reference to the underlying harmony and will ultimately resolve back to it. The idea that “there are no wrong notes” isn’t exactly true; notes can definitely sound very wrong if they aren’t properly contextualized with regard to the harmony. Free or changing meter. Jazz makes frequent use of polymeter and syncopation, which can give the impression of shifting meter, but most jazz doesn’t actually change meters, especially in improvisatory sections. The polyrhythms and syncopations work because they are overlaid on an unchanging metric pulse, and resolve to it.